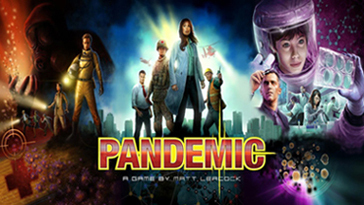 Pandemic: The Board Game is a digital adaptation of the highly successful multiplayer cooperative board game by Z-Man Games. The game is well regarded having received several rewards and has spent a good deal of time on the "Hot List" over at Boardgamegeek.com. The game is considered to be a "gateway game" into the world of more advanced hobbyist board gaming. The game employs some semi complex mechanics while remaining simplistic enough for people new to the hobby to enjoy. Add on to this some nice art work, an interesting theme and the strategic cooperative nature of play and you have a game that appeals to a lot of people. Pandemic: The Board Game is available for $6.99 on the platforms listed above, with one expansion "On the Brink" also available for $1.99 as an in app purchase. Players begin the game by picking a character, each with a specific "roll" or set of abilities. The player or players must determine how to best leverage the pros and cons of these specialists against threats as they emerge on the board. 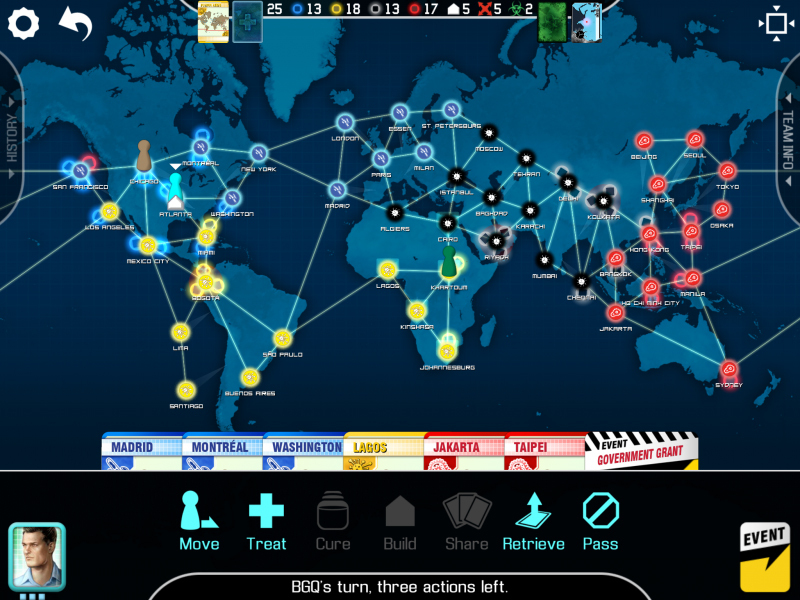 In Pandemic: The Board Game it is the players versus the game. Outbreaks will occur across the game board according to automated rules, the players must work together to contain and destroy the outbreaks, before they consume the worlds population. The digital version is aptly made by all accounts, rife with fine production and intuitive user interface layouts. The original board game's excellent graphical design shines through in the digital version. 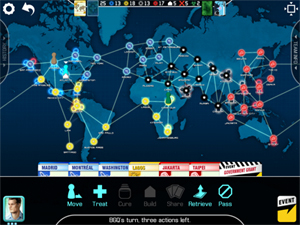 As in many cases the app version leverages the digital format to handle the game's sometimes fiddly book keeping and the back-end logic that runs the ai for the opponents (outbreaks), leaving players free to focus on collective strategies that might end the pandemic and win the game. The game currently ships with single player versus ai modes and the ability to play with up to four people pass and play. It is unknown if online multiplayer will be added in the future, but word has it that more expansions from the original game will make their way into the digital version.